7th April 2011 I recently met a friend for tea at The Rookery; she was staying and I rather wanted to see how it feels inside. The hotel is out of the centre of London in Clerkenwell, a popular area slightly to the North of central London with plenty of interesting bars and restaurants. Housed in a converted row of Georgian buildings, the interior is filled with fine furniture and accessories creating a warm, homely yet stylish setting. 26th April 2011 The May edition of Eyestylist focuses on beautiful sunglasses, however, with the wonderful weather that most of Europe is experiencing this Spring, we thought readers would enjoy an advance preview. It’s time to celebrate sunglasses! 23rd April 2011 I have followed Cazal for years. Designer Cari Zalloni has a unique style, and is particularly popular for his very individual designs of the 1980s. So this Limited Edition will become sought after..the company is re-releasing its four top sellers of the 80s, models CAZAL 623 – 856 – 901 and 904. The drawings of the models by Zalloni are great examples of the designer’s attention to detail, exuberance and passion for eyewear. Cazal’s 1980s vintage frames are increasingly sought after and the original editions of these models are quite rare, so collectors love them; it’s likely the new interpretations will attract excitement all over again (the rap world loves the Cazal label especially – Jay Z wears some of the classic styles – as does Usher, the R&B star). Chic and oh so cool! As this is our kid’s edition, I have been looking into a few places that aren’t as well known as some kids destinations in London but definitely offer lots of fun and interest. London has some great shops for kids, here are my favourite boutiques and shops for clothes, toys and furniture. (Pictured above: Their Nibs). Hoffmann opened the little jewel of a boutique – it’s just 25 square meters – four year ago, on a lovely tree-lined street in Montmartre, an area beloved by painters Renoir, Van Gogh and Picasso. The shop’s sparkling white interior is enhanced with antiques, another passion of Hoffmann’s. As the leading optician in the area for decades, she knows the value of offering superior quality frames and personal service. 6th April 2011 During a meeting in Milan, l.a. eyeworks (www.laeyeworks.com) introduced me to the books of the American author and illustrator Remy Charlip, of which Arm in Arm is a true classic for children, and most often cited. Remy is now in his eighties, and rather wonderfully he has collaborated with the Los Angeles eyewear designers to produce a design for their lens cloths this year (image above). The commission brief was for a design that would be a “dance for the eyes”. This is one of the first drawings that Remy has created since he suffered a stroke some years ago, making it all the more incredible; it is likely to become a highly sought after accessory. 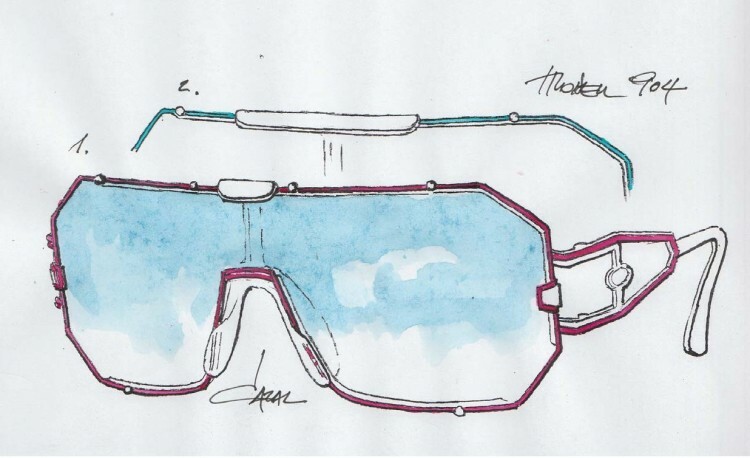 One of the reasons we have been following this store is that the owner, Alessandro De Lorenzo has launched a project to find a young eyewear designer called the DES-EYE-N Award, organised by LAB30100. Collaborating with prestigious stores around the world (see list below) the competition, which is designed for MA students studying fashion, product or industrial design, is open until end of April (30th) this year and entry is free of charge. For more information visit www.lab30100.com. Boudoir Venice; Optic Extrascharf, Berlin; Nathalie Bladt, Leuven; Oliver Goldsmith store, London; Optika Eclectic Eyewear, Saskatoon, Canada; Gogosha Optique, LA; Bruce Eyewear, Vancouver; Visual Culture Optical, Hong Kong; Loonen Brillenmakers, Oosterhout, the Netherlands; and Optica Toscana, Madrid.